Get ready for a holly jolly time as indie pop duo She & Him team up for their first stage outing in five years: A Very She & Him Christmas Party! 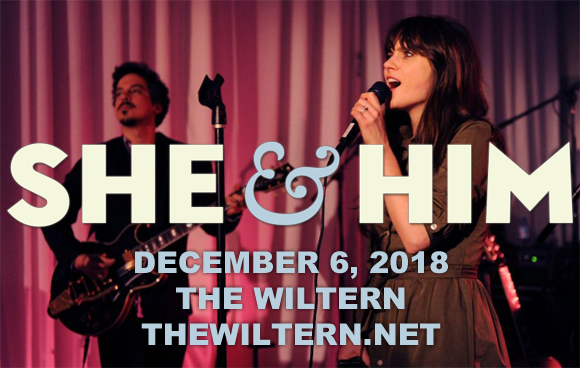 Coming to The Wiltern on Thursday 6th December 2018, Zooey Deschanel and M. Ward will undoubtedly be performing songs from their beloved holiday albums A Very She & Him Christmas (2011) and Christmas Party (2016), but who knows what else this lovable duo will gift us with this holiday season! American actress, model and singer-songwriter Zooey Deschanel and singer-songwriter M. Ward met on the set of the 2007 film The Go-Getter and, after bonding over shared music tastes and sending emails of songs back and forth, formed the duo She & Him. Deschanel is the duo's laed vocalist and also plays tambourine, piano and ukelele. Ward is also a vocalist and plays guitar and piano, as well as being responsible for production. Their first album, Volume One, was released in 2008 and was well received, including being voted the No. 1 Album of 2008 by Paste. To date, the duo has released six studio albums: Volume One (2008), Volume Two (2010), A Very She & Him Christmas (2011), Volume 3 (2013), Classics (2014) and Christmas Party (2016). In 2018, the duo will perform their first shows together since 2013.